Not a long one this time. Just been struck by the contrast between two pieces I've been working on this year, both coincidentally published within days of each other, which look at two different cutting-edge defence capabilities in great current demand yet which come from entirely different eras. 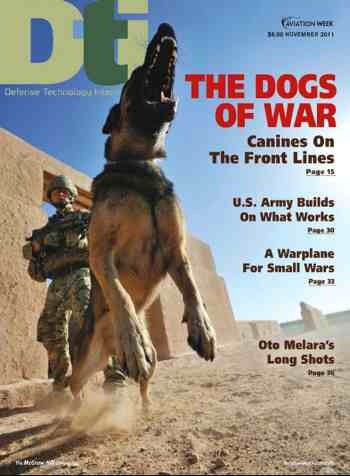 The first piece, which made the cover of the current edition of Defense Technology International principally because we had access to Sgt Blake's superb photo (above), looks at how the British military are using dogs during operations in Afghanistan. The second investigates a powerful surveillance tool made by the Italian company Hacking Team, which raises a number of interesting and important issues about what constitutes a cyber weapon, and how - or even if - international law currently views this emergent domain of conflict. That piece ran in yesterday's Sunday Telegraph, but didn't appear on their website; a longer, different version is up here, in the Features section. UPDATE (24/11/11): The Telegraph version has now been published and is available at this link.